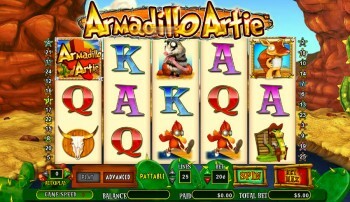 Armadillo Artie is a new addition to the list of slot games that are offered at Intercasino. This 5 reel, 25 payline slot features a horizontally expanding wild, a free spins feature, and an extra bonus feature that can be triggered during free spins. When playing the game, you will have the ability to select from various coin denominations to suit any casino budget. This feature will allow everyone the chance to enjoy the game regardless of the size of their casino budget. With a minimum bet of 25 cents up to a maximum of $250 per spin, even the highest rollers should be satisfied. 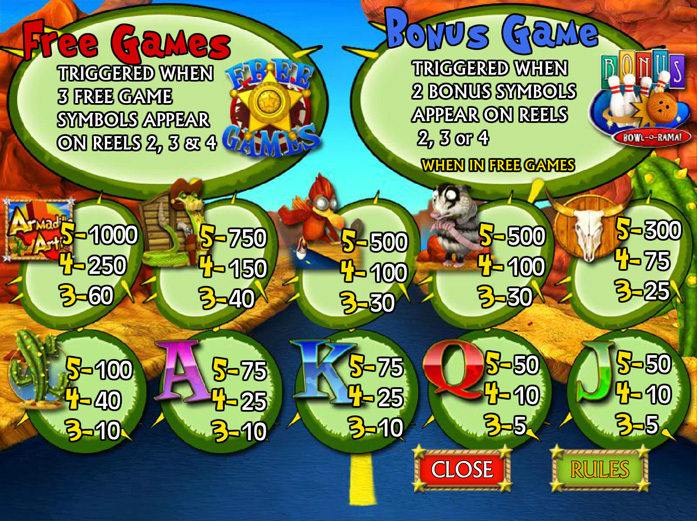 To help create more payouts, the game features an expanding wild symbol on reels 2, 3, 4 and 5. When the wild Artie symbol appears, he goes rolling to the right turning all symbols in that row wild, and will substitute for all regular game symbols. If an Artie symbol appears on the second reel, it will create an instant five of a kind win. The bonus feature that is offered in the game is a free spins round. When you activate the round with 3 of the Sherriff’s badge symbols, you will be rewarded with 10 free spins on the game. During these free spins, wins pay both right-to-left and left-to-right. I have found that really helps rack up the wins during free spins, mainly because the wild symbols appear on the last couple reels more often than on the 2nd and 3rd reels. The wild symbol still expands to the right, so you win every time it lands on one of the middle three reels during free spins. Unfortunately, the free spin round cannot be re-triggered, but there is another bonus game that will be offered. The Bowling Bonus round will be triggered when two or more bonus symbols appear on the middle three reels during a free spin. This bonus will award 3 free frames and each will consist of one roll. The maximum payout for this bonus round is 30 times your bet if you roll three strikes. 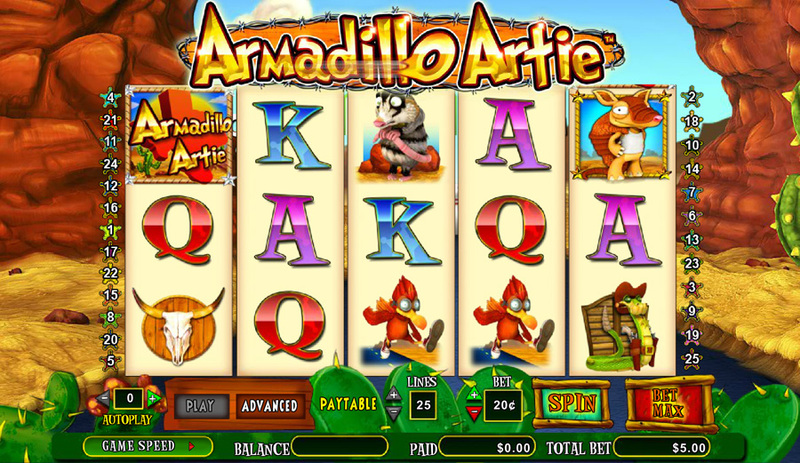 Armadillo Artie slot may not offer a huge progressive, but it can provide you with some very big wins. You can find this new slot at the Cryptologic casinos found on this website.